When you invest in a family photo shoot, you want beautiful photos. Your photographer will help you pick a beautiful setting that optimizes the season, lighting, and sets the scene. You are responsible for the other big part of the aesthetics—wardrobe! The right combination of outfits can make or break a photo shoot. But have no fear—a few simple tips can help you to style your whole family for the wow-worthy photos you crave. Here are some basic tips in preparing your outfits. 1. Be yourself!! Everyone needs to be comfortable, or it will show in the photos. While I love when a family gets dressed up, if that’s not your family, go for a more casual look. Aim for the best possible version of your own style. 2. Coordinate, don't match. “Matchy matchy” became a phrase because matching is out. Gone are the days of the whole family in white t-shirts and jeans. Instead, aim for a variety of complimentary colors and patterns. 3. Don’t go too extreme. Patterns and intentional splashes of color are good, but steer away from anything that is distracting. As a rule, stay away from graphics, florescent colors and anything too bright. 4. Choose clothing that fits. While I understand maximizing the value of your clothing, your photo shoot wardrobe isn’t the place for this. Don’t buy a dress for Jane hoping she’ll get a few years use out of it, but she swims in it for the photo shoot. Pick the dress that fits now. 5. Mom, this is your time to shine! 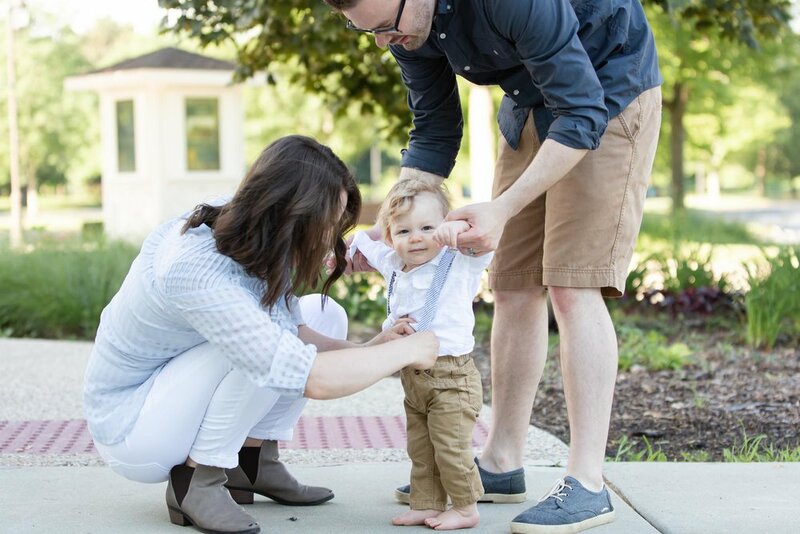 Moms are often the ones with the cameras and not in photos as much as the rest of the family—but not at this photo session. I love when a mom is in a dress (if she likes dresses) or an outfit she feels great in! Start with mom’s outfit and build the family style around that. 7. Attention to detail. Think of the whole outfit, head-to-toe. A great outfit with ratty shoes won't look as good. Match shoes with necklaces with headbands, etc. These items can add a pop of color too! 8. Consider the setting. If you’re doing a shoot in the late summer and there will be a ton of green at your location, leave green out of your wardrobe. If it’s fall, make sure you coordinate with the tones of fall. Ask your photographer for what colors she likes best for where you’ll be. Follow these 8 tips, and your wardrobe is sure to be on point! Interested in booking your photo shoot in the Chicago area? Contact Liz Binder Photography.